When booking accommodation in Ibiza you first have to decide which side of the white isle you want to stay on and what your budget is as you can either go crazy cheap or crazy expensive. The two party locations are San Antoni De Portmany and Playa de bossa which are thirty minutes from each other. 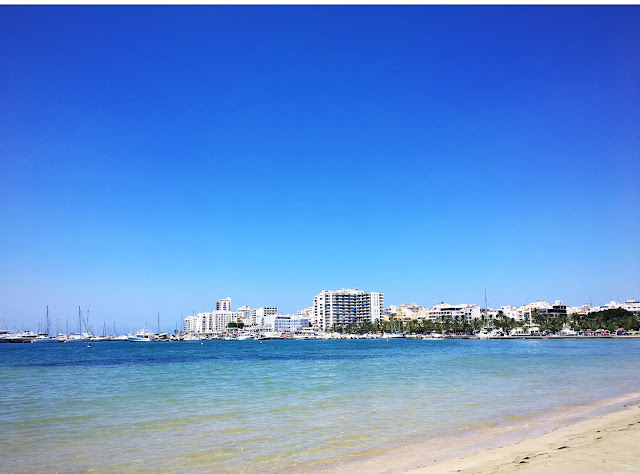 San Antoni is home to Cafe Mambo, Ocean Beach, Eden and Ibiza Rocks whereas Playa de bossa is closer to the airport, has better beaches and has your bigger clubs like Pacha and Ushuaia. 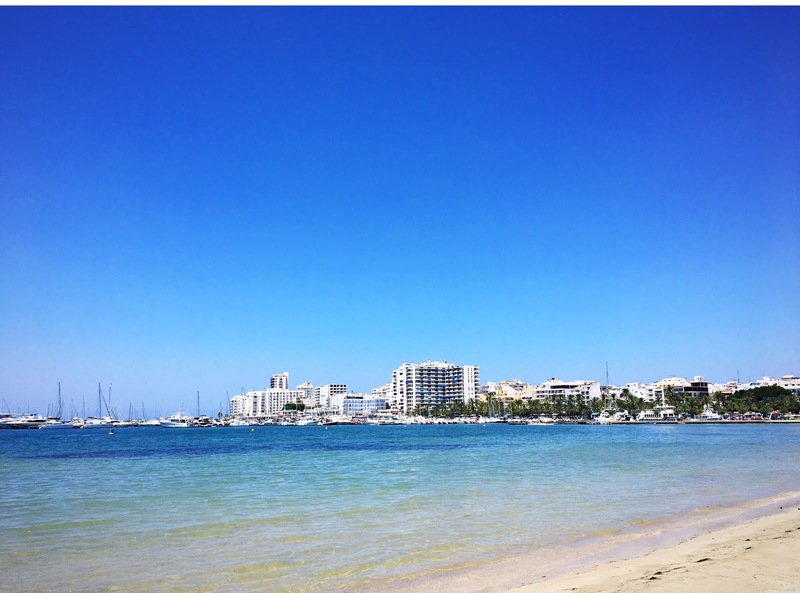 For our trip to Ibiza we opted for the cheaper side of the island San Antoni, so we could spend more money on food and partying, who spends that much time in their hotel anyway? The first hotel website I always check is booking.com as I am now a genius member having booked loads of times and you can select how many people you want in each room. We ended up staying at Hostal Mari in San Antoni De Portmany which was £70 each for 3 nights! It may only be a two star, but you have your own double room with its own bath/shower and also a balcony. This was only a 10 minute walk to the beach so was really central and their cafe next door served the perfect hangover cure - bacon and eggs! 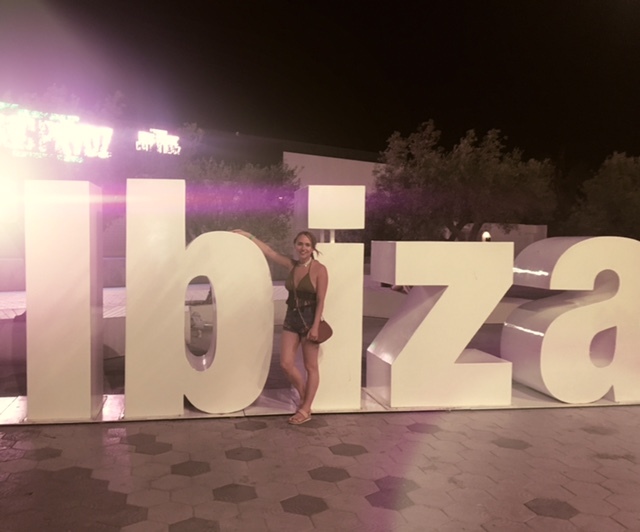 Being only in Ibiza for three full days we had a packed itinerary and we researched what DJs we wanted to see and the best clubs. I was worried before we went that we hadn't booked tickets but believe me when you arrive so many people will try to sell you them so definitely wait! However, before we went we did book a table at Cafe Mambo two months in advance because it's very popular and there was eight of us. In the evening the party really gets going with a live DJ, the atmosphere is amazing! We also booked our bed at pool party Ocean Beach by paying a deposit at that also gets booked up fast! If you love a pool party, Ocean Beach is a must we opted for the Kisstory party which is all R&B and even Fatman Scoop made an appearance which was mad! When you book a bed you get so much drink included but once that's gone it can get very expensive, but what the heck you're in Ibiza! With so many clubs to choose from playing a variety of music it really does depend on your taste but a lot of them do play a lot of house music or they have live acts. In my opinion Ushuaia is a must because its open air and we also went to the famous Amnesia which is huge inside, to see Chase and Status which was also fun. If I go again, I would love to party at Ibiza Rocks, I missed out on seeing Sean Paul this year and the brand new Hi Ibiza club which has the likes of Eric Prydz. Ibiza is as expensive as you make it. I set myself a budget of £500 and I still came back with money. If you want to do Ibiza on a budget you need to pre drink before you go out, don't eat at fancy restaurants and hopefully get into VIP at one of the superclubs. Cafe Mambo is 100 euros each to get the better table but for that we got a lot of food and drink. 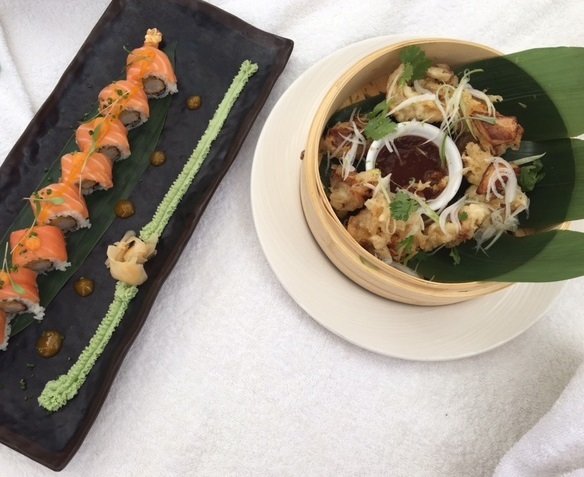 Ocean Beach on the other hand is very overpriced for food and drink but I did have the best sushi and an amazing time! In terms of alcohol, a mixer will cost you over twenty euros in the bigger clubs but then in the west end in San Antoni where there are smaller clubs/bars playing music the cost would only be seven euros. Because it gets so hot you will end up buying water which is the ridiculous price of nine euros for a small bottle in the clubs. For this holiday I bought so many new clothes because I knew when I was out there everyone was going to look drop dead gorgeous and it's acceptable there to go all out! I packed a lot of shorts, crop tops and dresses which you can see here. My first casual day outfit was a pair of Topshop denim shorts and a paisley bodysuit from Boohoo. Super comfy choice for the 32 degree heat! On the evening we had a table booked at Cafe Mambo so I wanted to wear something a bit more special. 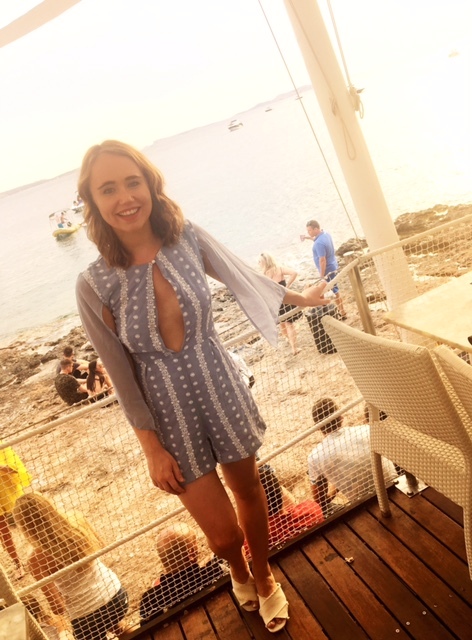 I bought this gorgeous blue cape playsuit from Boohoo at ASOS in the sale for just £10, there was some serious plunge going on but I loved how it fit and it's so pretty! 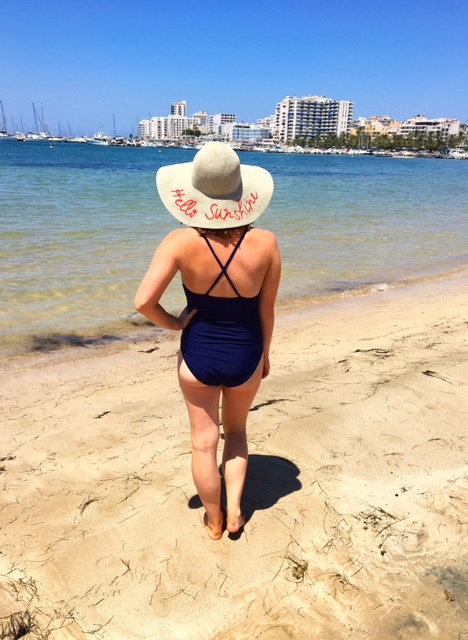 The next day we headed to San Antoni beach which be warned isn't the most fancy beach but it was a chance to relax, catch some rays (or sunburn in my case) and wear my new cute floppy hat from Tu Clothing! That evening I was super excited because we were heading to Ushuaia to watch David Guetta's DJ set, as this is outside you want to wear something cool so my glamorous denim shorts and Boohoo crop top were perfect. Throw in some glitter, floral shades from Peacocks and a Topshop choker and I'm looking more like I'm going to a festival. On our last day in Ibiza, we had a bed booked at Ocean Beach pool party where all the girls dress poolside glam so I had the perfect gold swimsuit from my go to swimwear brand: South Beach. Ibiza looks like the place to be! Love your outfits. Especially the playsuit. The food looks amazing as well. It looks like you girls had a fabulous time in Ibiza!